Are you looking for an annual or perpetual license? Are the computers located in one room, in various locations across your organization or in multiple locations? Who will be using the license: Students only? Academic professors, staff and students? Corporate, government or non-profit researchers and other users? Do you want to install the software on stand-alone computers or install the GAUSS Software on a Network License server, cluster or virtual machine, etc.? How many users need to access the software at any one time? Do you need home or off-site use such as for traveling? License Installation: Two permanent installations on the local hard drive of a personal computer or workstation, such as a work computer and a personal home computer (which may be a lap top computer). License Limitations: The GAUSS Software cannot be installed on a server, including cluster and virtual machines, or accessed over a computer network. Multi-Users working on Single Designated Workstation: Licenses for multi-users on a single designated workstation, including remote-access login are available. Contact Aptech Customer Service for more information. License Installation: Two annual installations on the local hard drive of a personal computer or workstation, such as a work computer and a personal home computer (which may be a lap top computer). License Installation: The GAUSS Software is installed on a License Server, including cluster and virtual machines. The GAUSS Software is accessed on client computers that are connected to each other over a computer network for use up to a specified number of concurrent users. 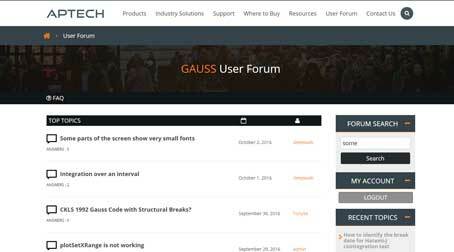 Number of Users: The GAUSS Software may be installed on an unlimited number of client computers. The number of sessions of the GAUSS Software that can be checked out at any one time is limited to the number of seats (concurrent users) purchased. Usage Location: Anyone who can connect to the License Server can check out a session of the GAUSS Software. Unlimited Campus Site License allows the GAUSS Software to be installed on an unlimited number of stand-alone and/or networked computers at one campus location. The Unlimited Campus Site License does not include other campus extensions. Unlimited Department Site License allows the GAUSS Software to be installed on an unlimited number of stand-alone and/or networked computers within one university department, such as the Department of Economics. Unlimited Corporate Site License allows the GAUSS Software to be installed on an unlimited number of stand-alone and/or networked computers at one business location. The Unlimited Corporate Site License does not include other business locations. GAUSS in the Classroom is a program for classroom teaching purposes. An annual license of the full version of the GAUSS Software is provided free to students for installation only on the student's personal computer. Professor must own or have access to the latest version of GAUSS and any in-house GAUSS Application Modules that he/she would like the students to be able to use. License Installation: The GAUSS Software is installed on a specified number of stand-alone and/or networked computers located in one computer lab or classroom for teaching purposes only. Usage Location: Used in one room computer lab or classroom only. License Limitations: For student's class work use only. No professor or research use. License Installation: A Site License allows the GAUSS Software to be installed on a specified number of stand-alone computers at one business or campus location. The Site License does not include other business or campus extensions.